Appetizers are the perfect way to welcome your guests and kick off the evening with friends and family. These tasty little bites are not only fun to eat, but they’re often easy to make and can buy you crucial time needed to prepare your main course. The grill just so happens to be a perfect place to prepare hot appetizers, so today we’ve lined up two fresh new recipes to try at your next gathering. 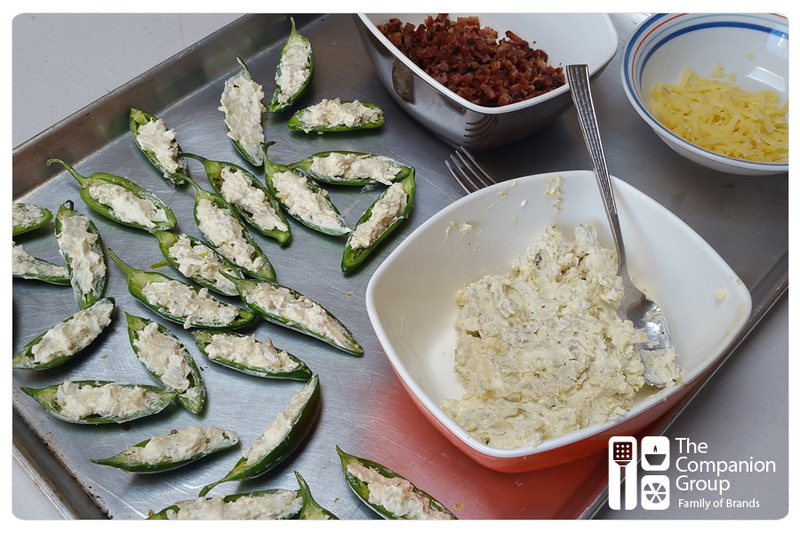 If you like jalapeño poppers, chances are you’re going to love this recipe. Instead of removing the top stem portion of the pepper, these jalapeños are cut horizontally for a fresh and unique presentation. 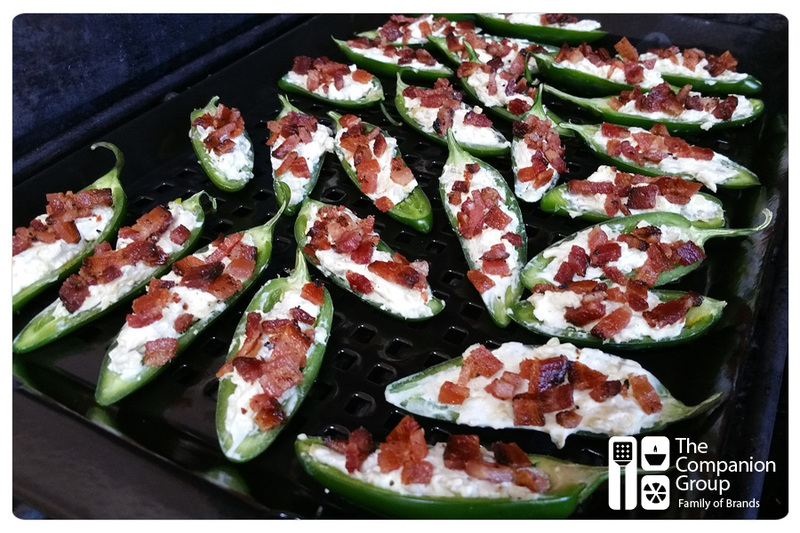 After stuffing them with a mix of cream cheese, cheddar, artichokes and bacon, the peppers are cooked on a blazing grill adding a hint of smoky char flavor. Allow cream cheese to soften at room temperature for 30 minutes. Slice jalapeños in half vertically and remove seeds. Cook bacon strips and cut into small pieces. Place cream cheese into the bowl of a stand mixer and mix on medium speed with a paddle attachment for 1 minute. Add cheddar and artichokes and mix on low speed for 30-40 seconds until incorporated. Place 3/4 – 1 tsp. of the mixture into each jalapeño. Add bacon crumbles on top of each stuffed jalapeño. Place peppers on a grill grid and grill 7 to 10 minutes over medium-high direct flame, or until peppers are soft and cheese mixture is warm. These stuffed mushrooms are the perfect bite sized treat for any occasion. Creamy Gouda cheese and fresh rosemary combine with the earthy/smoky flavors of grilled mushrooms in this recipe. 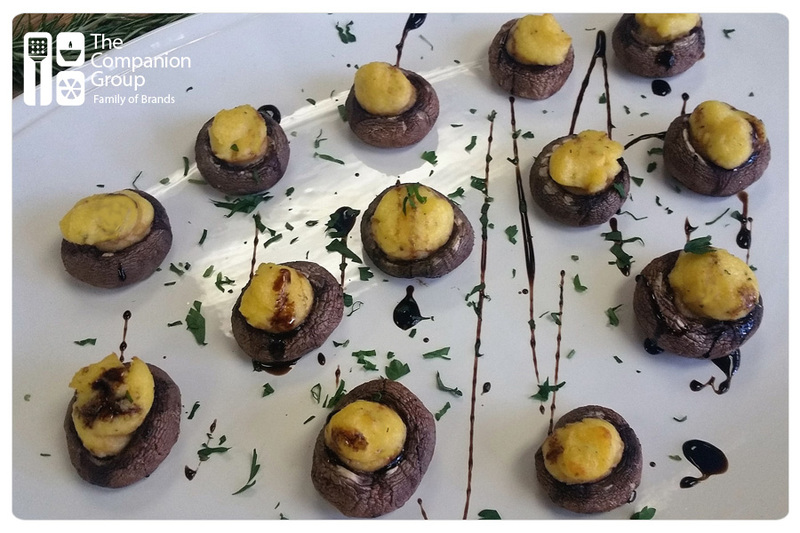 Finished with a small splash of balsamic glaze these stuffed mushrooms are sure to get any crowd talking. Remove stems from mushrooms and wipe caps gently with a paper towel. 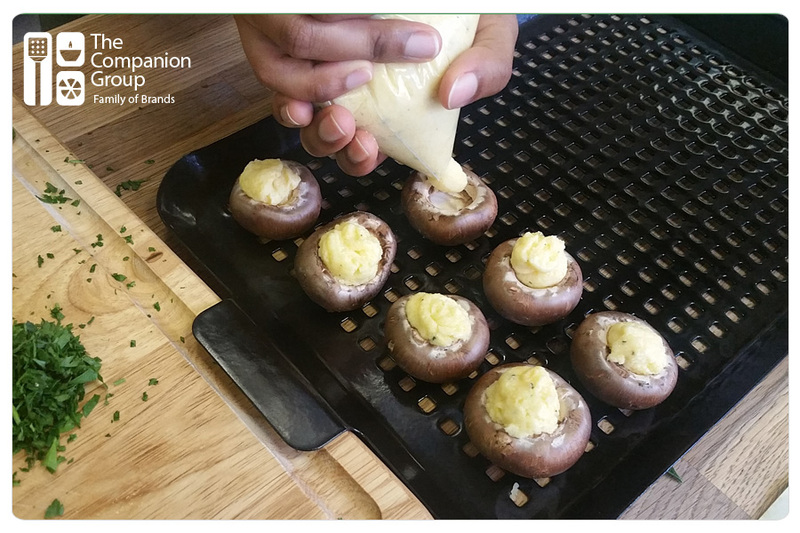 Remove a small slice from the top of each mushroom cap with a knife so that caps will sit flat when grilled. In a medium sized sturdy bottom pan, bring water to a boil over high heat and add salt. Pour cornmeal slowly into water, stirring with a wire whisk or wooden spoon. Continue stirring as mixture thickens, 2 to 3 minutes. Add cream and stir to incorporate. Turn heat to low and cook for at least 30-45 minutes, stirring every 5-7 minutes until polenta is fully cooked. Add shredded Gouda and rosemary to polenta and stir to combine. Allow polenta to cool, and then add to a large plastic bag. Shift the polenta to one side of the bag and twist into a cone. Point the tip of the bag upwards and remove ½” with scissors to create a piping bag. Gently squeeze polenta into each mushroom cap until all caps are full. Place mushrooms on a grill grid and cook 12 to 15 minutes over indirect heat until tender. Drizzle balsamic vinegar glaze over the top of the mushrooms and garnish with minced parsley.